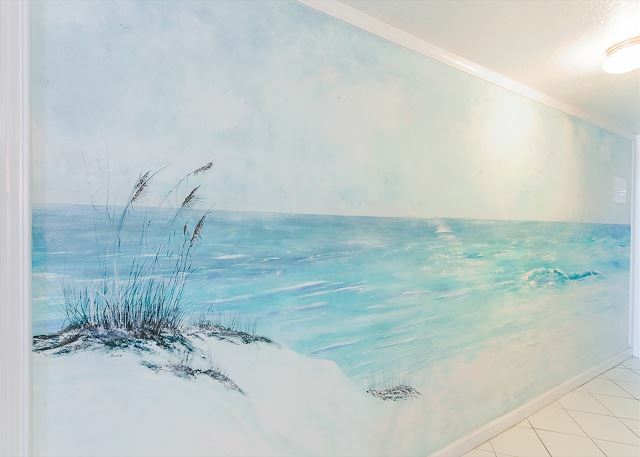 Guests of unit 203 are greeted by a wall mural, painted by the owner, of our beautiful beach. 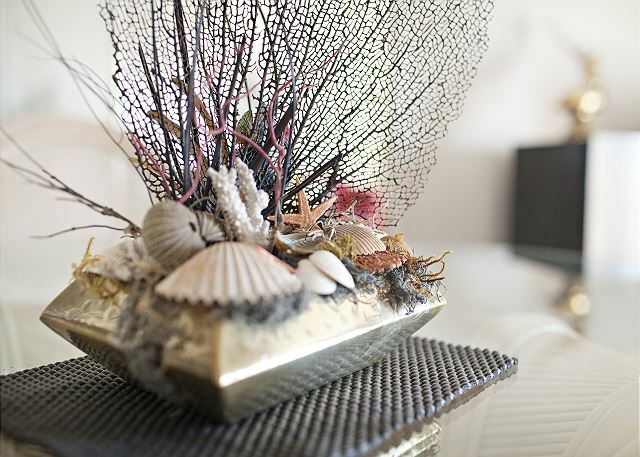 Other unique art work is found throughout the unit. 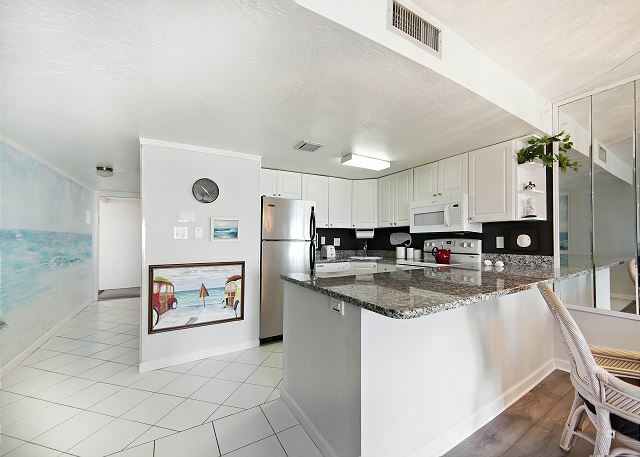 Granite counter tops, a smiling whale, and an interesting frog are features of the kitchen. 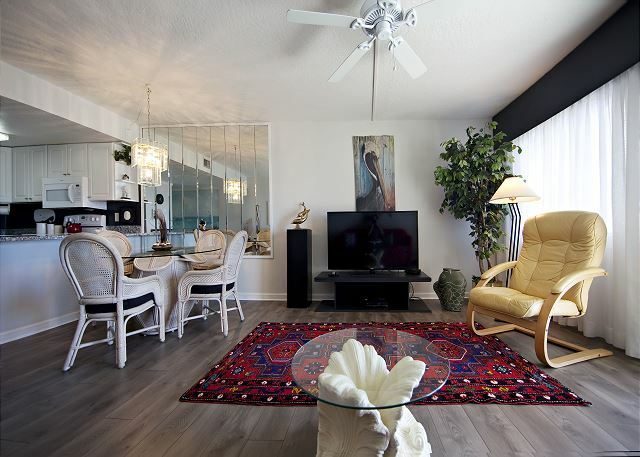 The red, yellow, and black color scheme of the living room is dramatically highlighted by a beautiful Turkish rug. 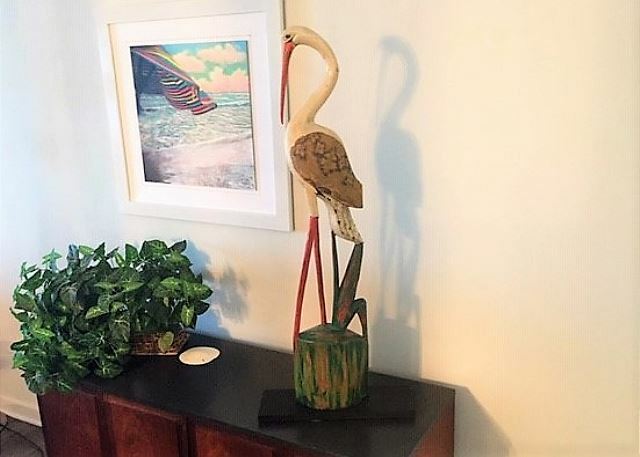 A curious pelican keeps a watchful eye over the room. 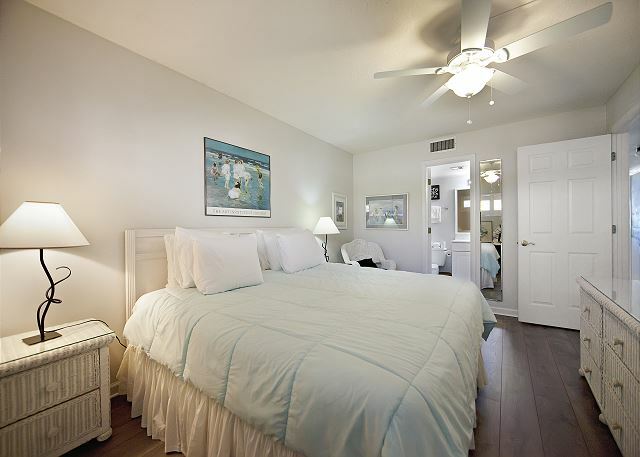 The light, airy bedroom is the perfect place to relax after a busy day on the beach. 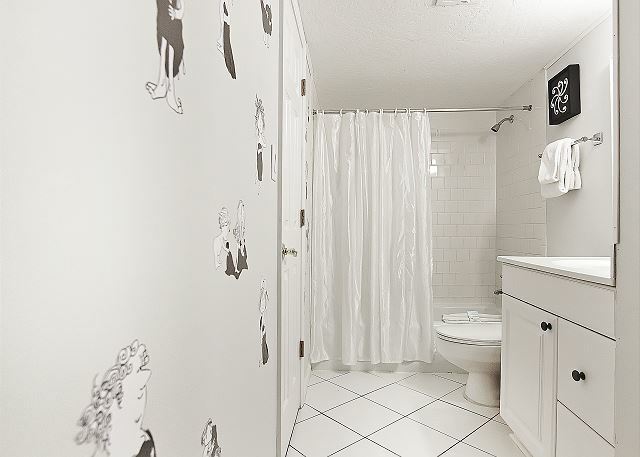 In the adjoining bathroom, caricatures of people at the beach and the “Evolution of a Beauty Queen” are sure to bring a smile. 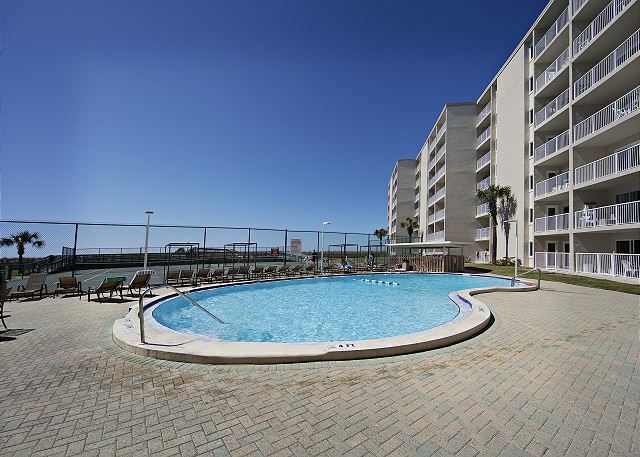 This unit is located near the west end of the building, letting you enjoy the balcony without the direct afternoon sun. 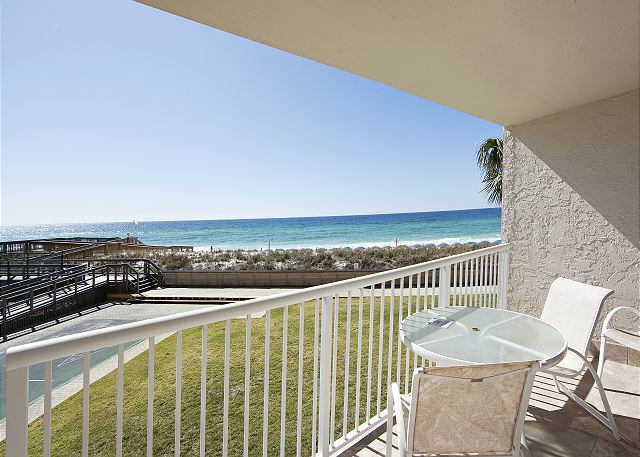 Nearby stairs allow you quick access the beach -no waiting for the elevator. 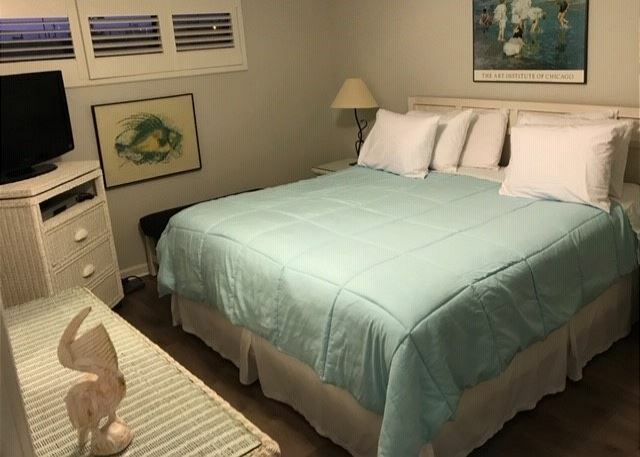 Holiday Surf and Racquet Club unit #203 accommodates up to 4 people with a King bed and a Queen sofa Sleeper. 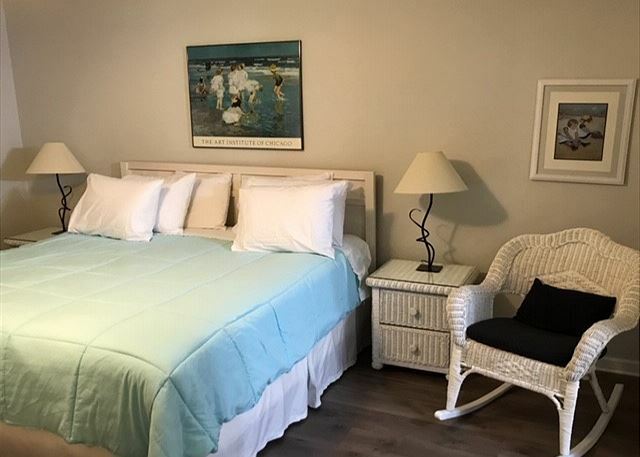 Staying in Unit 203 will help you say, “We had the perfect beach vacation “. 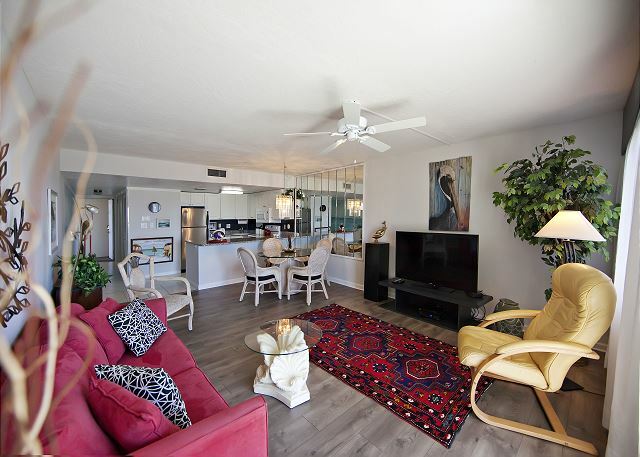 Condo perfect for R&R. Very quiet! Tastefully decorated. 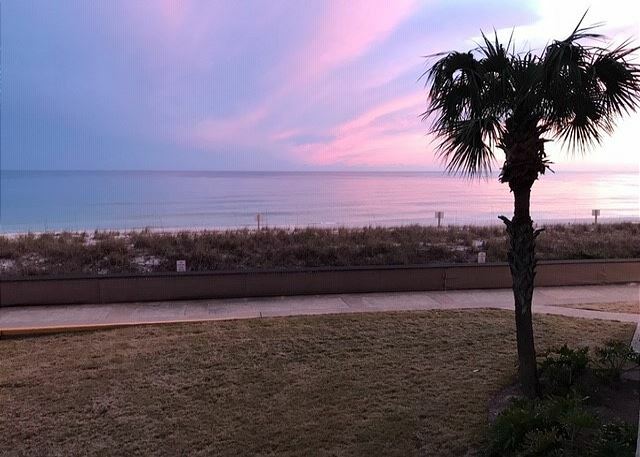 Beautiful view of the Gulf! 2nd floor convenient to stairs. 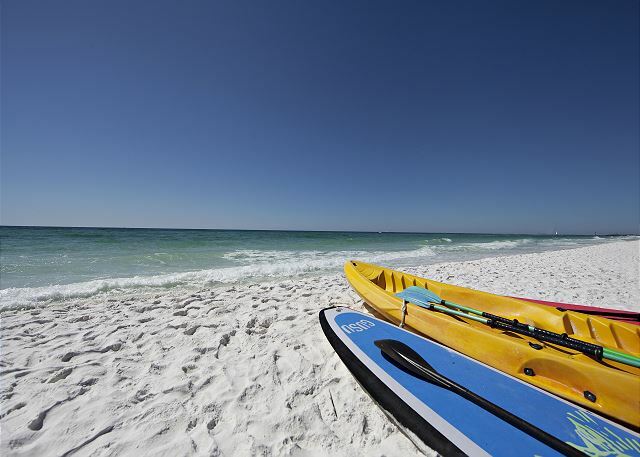 Destin has everything for the beach goers. Holiday Surf has the best staff. 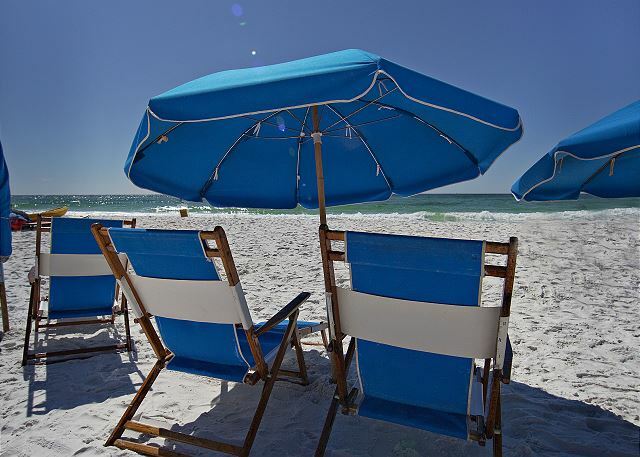 The only draw back is uncomfortable lounge chairs at the beach. However, I shouldn’t complain for two chairs and an umbrella comes with the rental of the condo! Already planning my next vacation there! Love it! We thought the room was clean & comfortable. This is our second time this year staying at your condo's, we would like to come again in the future. We enjoyed it. 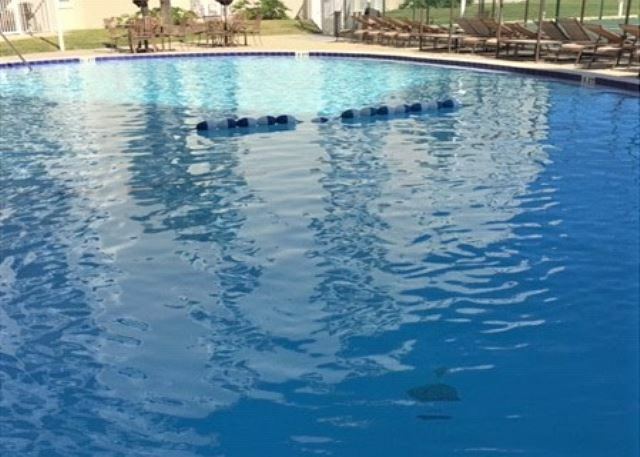 Thank you for your wonderful review from your recent stay at Holiday Surf and Racquet Club! Please let us know when you can come back down! 5th time at holiday surf. 3 times with family growing up, and 2 times as an adult myself with my girlfriend. 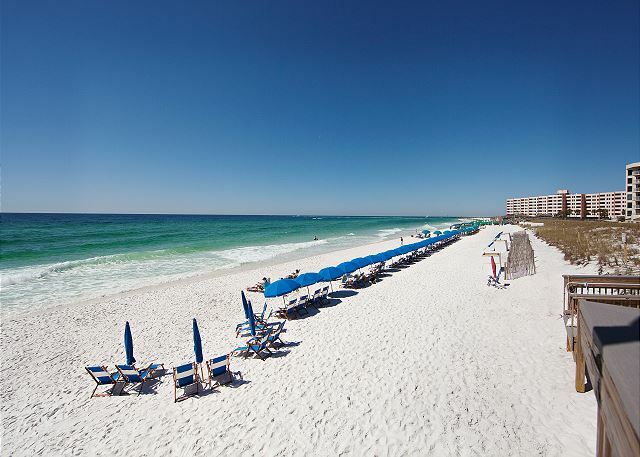 I always stay here when visiting florida and this last stay convinces me this is where I want to come again next time. 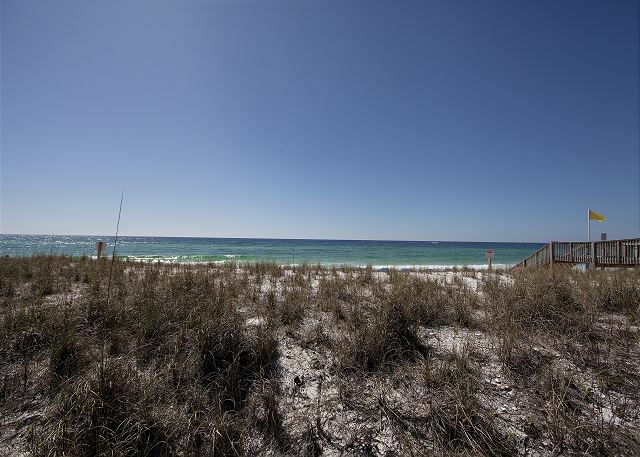 Very clean, furnished well, great beach access, everything is great working order! Our room was very well decorated. The location was great near the end of the building so we could walk down one floor around the corner and head to the beach. We stayed in 203. 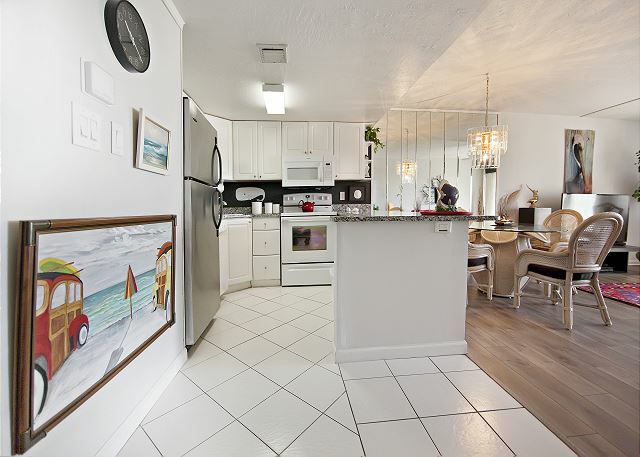 Great condo!!!! Beautiful view, nice decor. Comfortable bed. Just lovely. Bathroom fan was not working. Besides that we look forward to visiting next year!!!!! 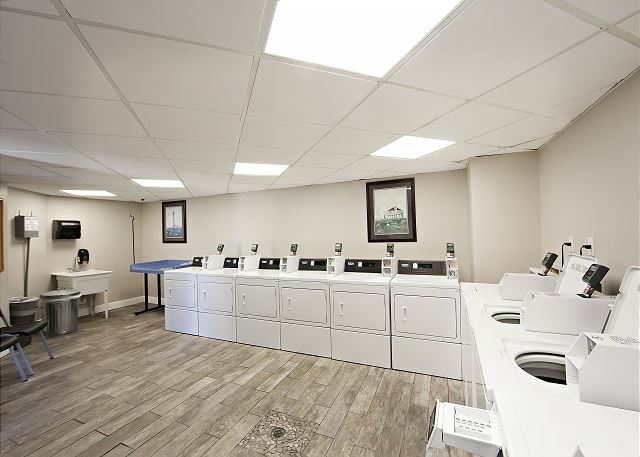 Overall ok, would suggestion updating amenities to coin laundry. We expected a w/d unit in the condo. 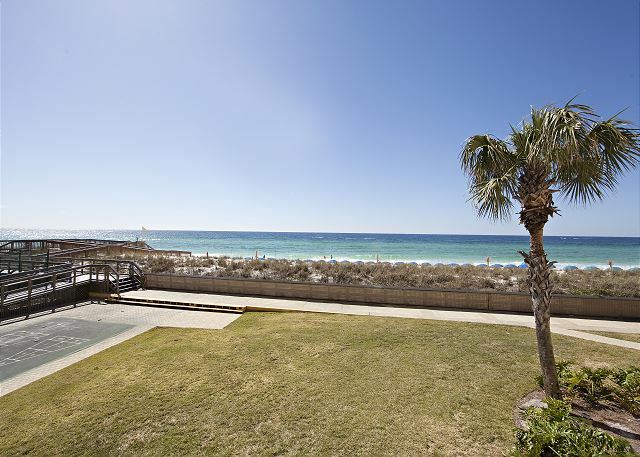 This was our first time staying in Destin. We really enjoyed staying here. Staff was super friendly. The free beach set up was so nice with little ones. 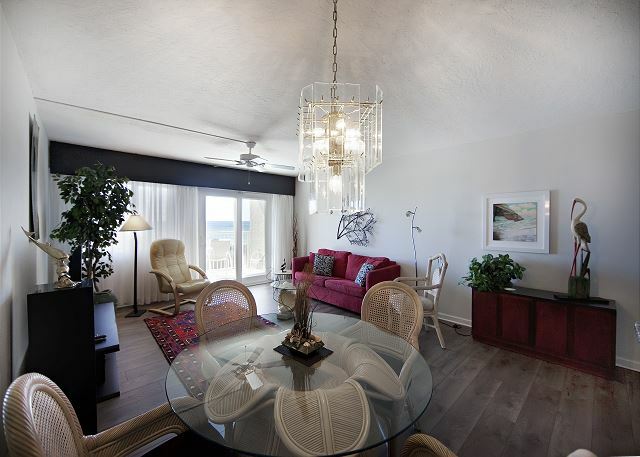 Loved the location of this condo as it was a short walk to the beautiful rocks at the bay. Unfortunately, we picked the week that tropical storm cindy decided to show up. Since we were paid in full and it was less than 10 days out we found out about the storm we went anyway. The room was great and the staff was great. I'd just recommend you to get insurance due to the 10 day cancellation policy. 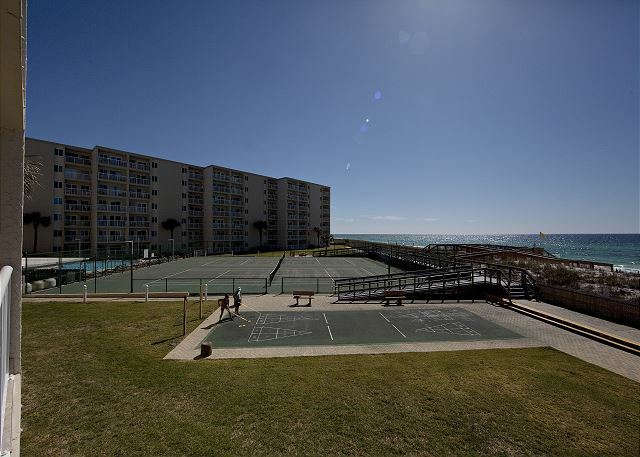 I have been staying at Holiday Surf and Racquet for years. 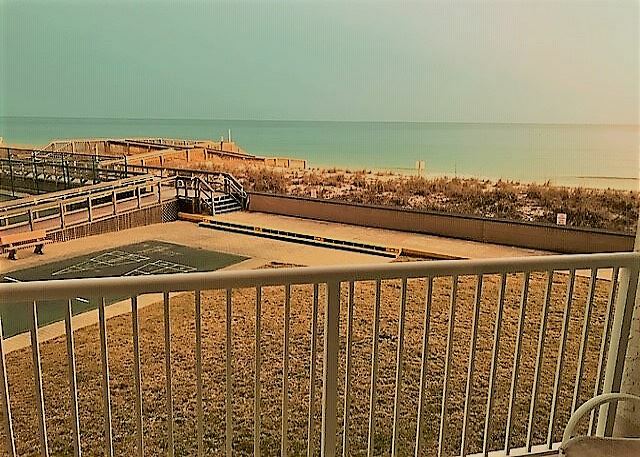 I love the set up of this place, every room faces the ocean, you just have to decide if you want the sun on your balcony in the morning or afternoon. The grounds are always spotless, and should you need any type of maintenance for your unit they are there in a jiffy! One year I stayed in unit 203. I have been hooked ever since. I LOVE this unit. It's decorated so nice. Everything you could imagine you would need is there. It is sooooo perfect! 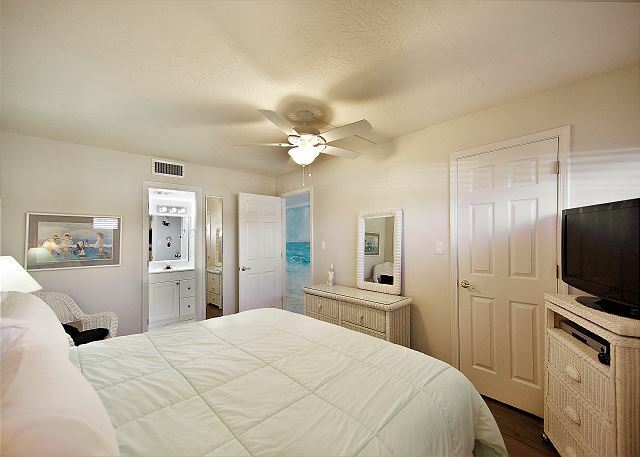 It's closer to the beach, short walk down the stairs and you're there! This place is so pretty. Location is spectacular! It's convenient to all shops, grocery stores and restaurants. 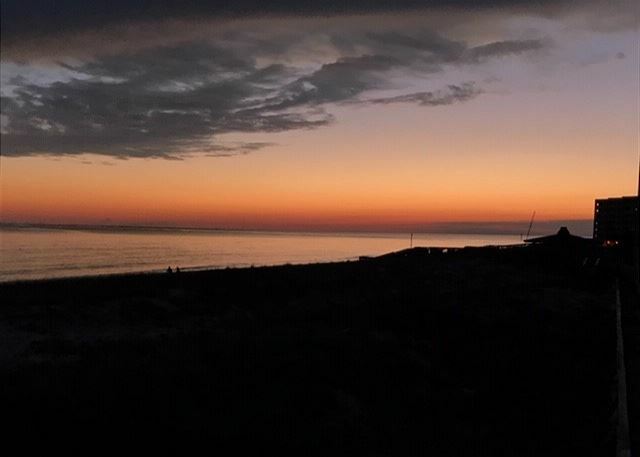 I never want to stay anywhere else! Thanks Holiday Surf and Racquet. See you next year!